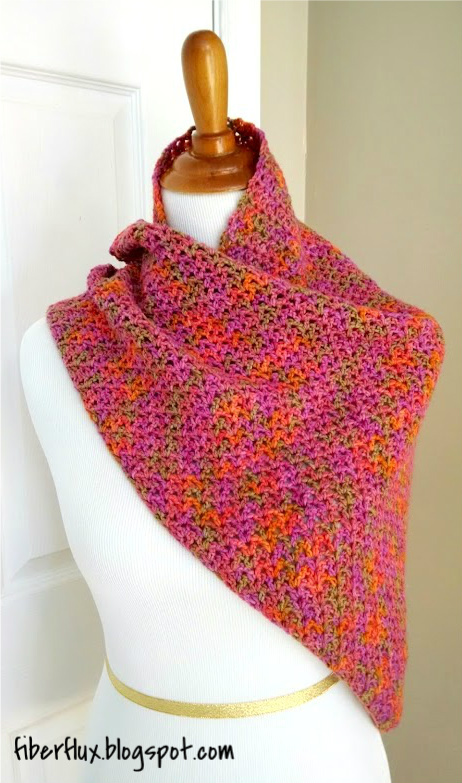 Fiber Flux: Free Crochet Pattern...Zinnia Flower Shawl! 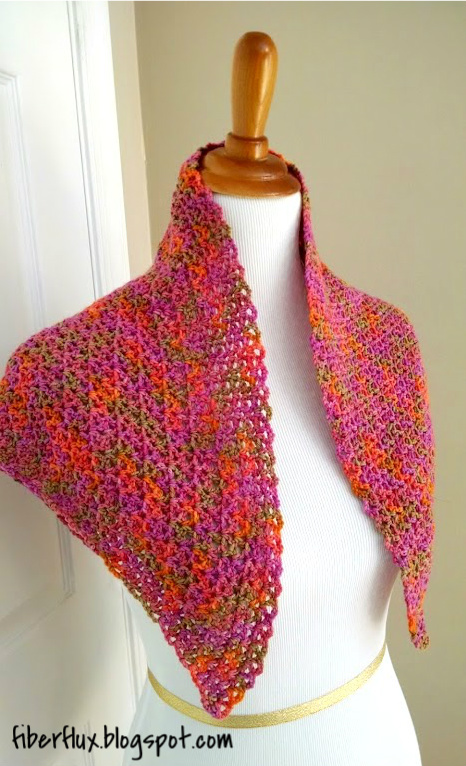 Free Crochet Pattern...Zinnia Flower Shawl! 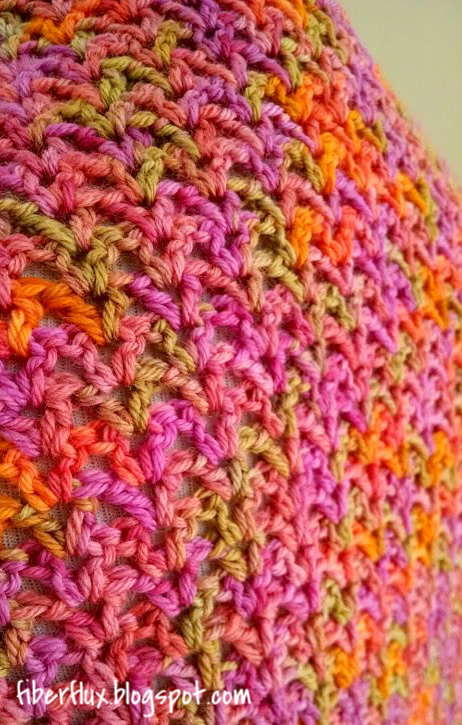 The Zinnia Flower Shawl is a breath of fresh sunshine, crocheted in bright and happy colors. This triangle shawl is worked in an all over V stitch and finished off with a super simple edging. Perfect when you need a little something extra to throw over your shoulders. 492 yards of your favorite sock yarn (yarn used for the shawl shown is Cascade Heritage 150 Paints in the #9791 colorway). If you'd like your shawl to be larger or smaller, please adjust yarn accordingly. Foundation Row: Chain 7. In 4th chain from hook (dc, ch 1, dc) all in the same chain. Skip two chains, and in the next chain (the last chain), work (dc, ch 1, dc) all in the same chain. Row 1: Chain 3 and turn. Work (dc, ch 1, dc) in each of the chain 1 spaces from the previous row (center of each "V"). At the end of the row, finish with a (dc, ch 1, dc) in the last space (ch 3 turning space). Repeat row 1 until you reach the second to last row. Edging Row (Last Row): Chain 3 and turn. In each ch 1 space from the previous row (center of each "V"), work (dc, ch 3, dc). Work a dc in the turning chain space and fasten off. Weave in any ends and you're finished! Please note: Patterns are for personal and charity use only. In addition, if you enjoy the pattern, please link to it, but do not copy the pattern to your own website or blog (including other languages). Thank you! This is so pretty, thank you. I love the pattern not hard to do for this older lady. You explain it so well thank you and show us what you are doing. Again thank you I will keep watching for your other patterns. This is beautiful and so aptly named. 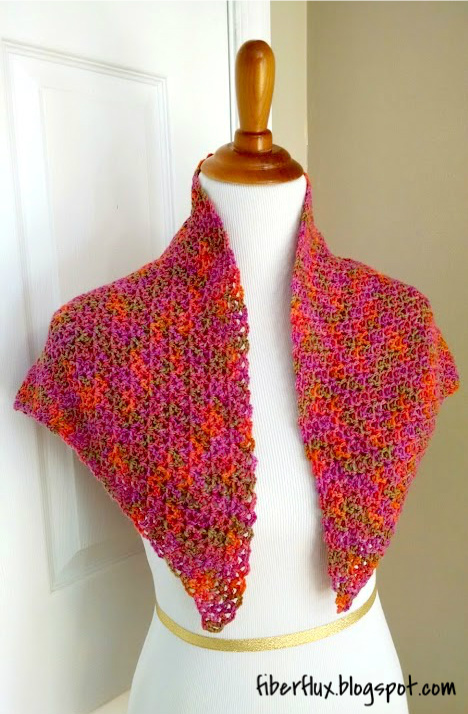 I just love zinnias and this shawl! Q re: the 'print-friendly' feature? It doesn't work without downloading 'other' things (not wanted). Is cut & paste the only other remedy? 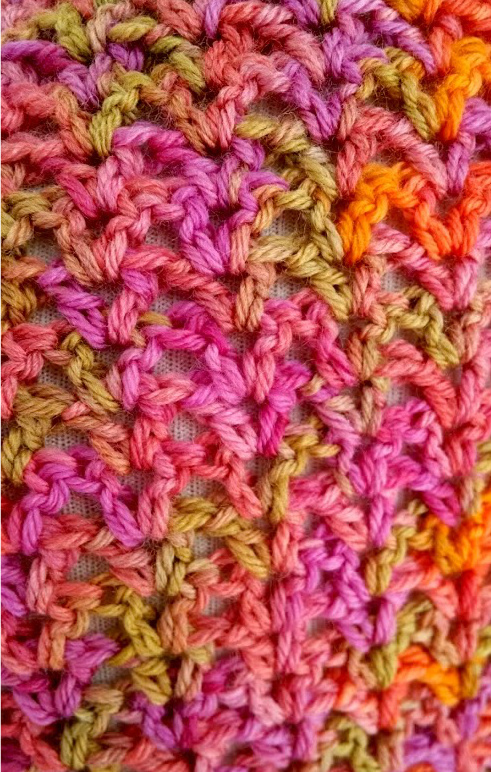 You have such lovely patterns, well written and easy to follow, but I don't sit in front of my computer to crochet. Funny. I was just thinking how much I love PrintFriendly. Hadn't seen it until a few months ago. You don't have to download anything else - just use the PrintFriendly button. It allows you to delete anything on the page (for example you can eliminate pictures you don't want simply by clicking on them). It shows how many pages will print. If there are more pages than you want, just click on any paragraphs you don't want and they are gone. At the same time, the number of pages is re-calculated. Wish more sites had it available. Hi there! That is absolutely correct, you can "hover" over any section you don't want and a little button will pop up to delete, I know lots of people don't like to print photos and use up a lot of ink, this will allow you to only keep what you need...I hope that helps you! One more thing...if you are getting other posts on the page, just click the link the post you want (by clicking on the post title), then click the print friendly button after...it will just have that post on the page. I love love love this pattern!! However, I can't seem to find the colorway used to make this shawl. I even checked the Cascades Yarn website. I think this coloway makes the pattern and I can't picture it in any other color. Help! Where did you get the yarn? Please, please don't tell me it's discontinued! At the moment I posted these links they are in stock, hope that helps!! Received the yarn today. Can't wait to start hooking this shawl! My niece (and goddaughter) planted some zinnia seeds for me for Mother's Day when she was 13. I harvested the seeds that fall and have re-planted them every year since then. She turns 26 next month and this will be her special gift from me. Thanks for the links (and the beautiful pattern)! 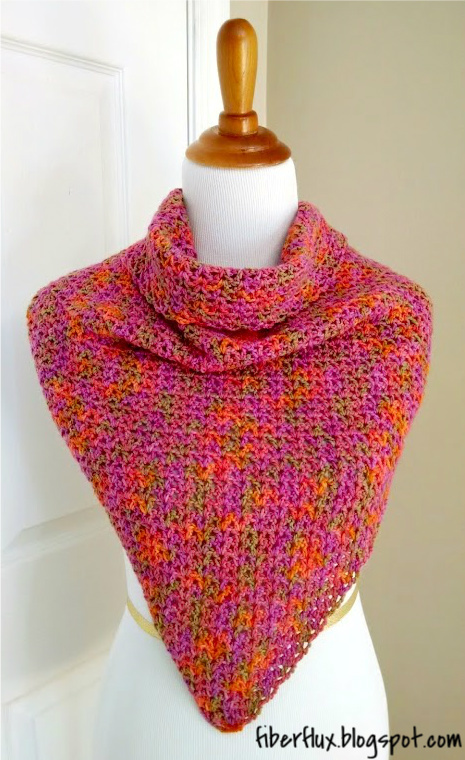 Thank you so much for sharing your lovely new shawl pattern! It is just perfect for when you need a light layer for your shoulders; and I love how the edging gives it lacey, delicate finish. You are always so generous with your patterns and advice; I am very grateful. And, a special thank you for the ''print friendly'' option! Just finished making this with a thicker yarn and a H hook. I LOVE it!! Made this using Lion Brand Vanna's Glamour in onyx. The slight "sparkle" of the yarn is striking. I think that my mother-in-law will enjoy wearing this to any dress up event at her retirement community. That sounds stunning, and what a lovely and thoughtful gift too!
? Mine is almost 36 inches long, but only 22 inches across. Don't see why it hasn't widened out more. I can fairly easily go back and add in some extra v's, but I've followed the instructions carefully. Any idea what I've done wrong? 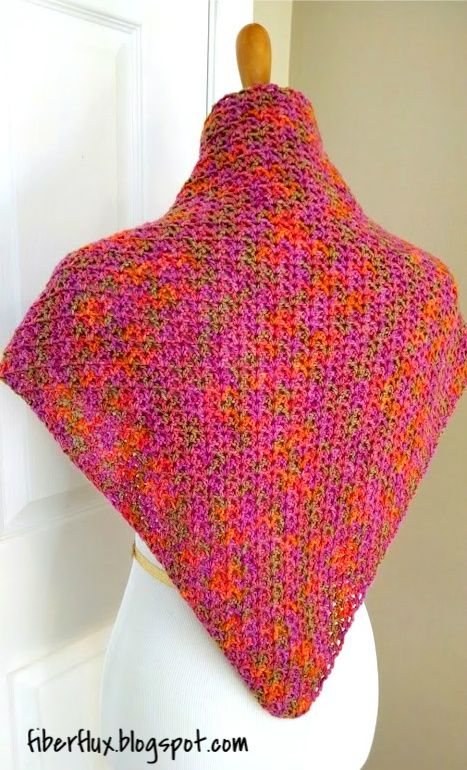 This shawl is so pretty! I already made it 3 times for friends! I was wondering, how can I make it shorter and wider? Where should I add more Vs? I tried adding 2 Vs in the last space (instead of 1 V) but it doesn't look right. Can you help me please? Thank you!! How would it look if I added fringes to the side. And how would I go about doing it? Thank you. I feel truly blessed to have these free patterns available to me. Thank you so much for providing this pattern.